In an impossibly distant future, our species has dispersed to the stares. Travelling in slender spacecraft, armed with projacs and needle guns, we have settled countless worlds. Cultures are everywhere different, yet propelled in the end by fundamental qualities humankind cannot shed: greed, egoism, pettiness, and a crippling passion for procedure. Designed by the master of both systems, Robin D Laws. 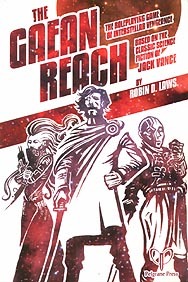 Limpid GM advice give you the tools you need to game out the elegant schemes and sinister counter-schemes of Vancian SF.